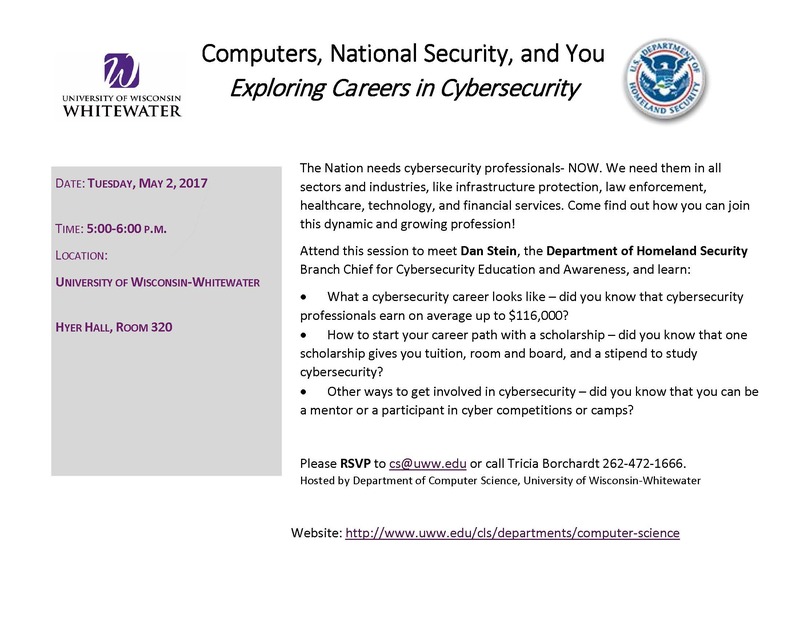 The Department of Homeland Security Cybersecurity event held 5/2/17 was very well attended. 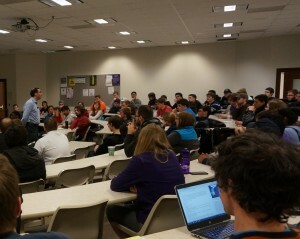 Branch Chief Daniel Stein presented a wealth of opportunities for students in the field of cybersecurity, including fellowships, co-ops, internships, scholarships, certificates, work study programs and other educational opportunities available both within the government and other entities. Click on the photo link below to view a website with some of these opportunities listed. https://www.intelligencecareers.gov/icstudents.html. 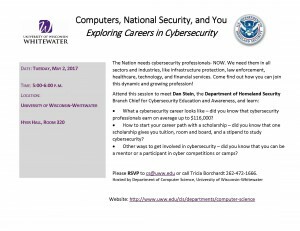 Dan Stein, Branch Chief for the Department of Homeland Security, Division of Cybersecurity Education and Awareness will present at 5:00 p.m. in Hyer Hall, Room 320 on May 2, 2017. Click photo above for more details. Search HawkJobs for employment opportunties. We’ve received several calls from people hoping to employ computer science majors for part-time and full-time positions in the past two days. 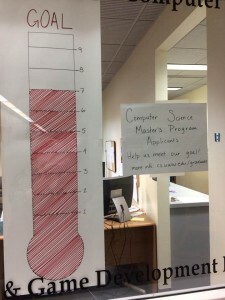 GOAL MET FOR MS IN CS PROGRAM! We have met our goal of 10 applicants for the first semester. We will continue to accept applications for Fall 2017 through June. Minwoo Lee of Colorado State University will present his research titled Sparse Bayesian Reinforcement Learning for Robust and Efficient Learning Monday at 12:45 p.m. in McGraw Hall, Room 122. All Computer Science majors (sophomore and above) and all MAGD-Technology majors (freshman and above) will require advising to have their hold on Fall 2017 scheduling of classes removed. One way a student can do this is by attending walk-in advising. The scheduled times are: Wednesday, March 15th from 3:30-5:30 in McGraw 122; Wednesday, March 29th from 12:30-1:30 p.m in McGraw 122 and Friday, March 31st from 10:00 a.m. – 12:00 noon in Hyer 210. Another option is to attend your advisor’s office hours which can be found here. Bring a copy of your AAR (Academic Advising Report) to advising. 12:45-1:35 p.m. Arnab Ganguly of Louisiana State University will present his research on Succinct Data Structures for Parameterized Pattern Matching. The presentation will be held in McGraw Hall, Room 122. The abstract can be found here. Dr. Andrew Sutton of Hasso Plattner Institute at the University of Potsdam in Potsdam Germany will be presenting his research today in McGraw 122 at 12:45 p.m. Click here to view abstract. in Computer Vision and Pattern Recognition. May 21 – July 28, 2017 at University of North Carolina-Wilmington. 10 week program includes $5,000 stipend and free housing. Follow the link for more details. Anyone interested in the topic is invited to attend. Dr. Kuan Zhang of University of Waterloo, Ontario Canada will present his research on this topic Monday, February 27, 2017 from 1:00 – 1:50 p.m. in McGraw Hall, Room 122. More than 2/3 of the way to goal of 10 applicants for our graduate program to begin Fall 2017. Interdisciplinary Study of Mind and Brain at the University of Pennsylvania. June 4-17, 2017. Click link for more details.